ISLAMABAD, Aug 16 (APP): Federal Minister for Planning, Development and Reform Ahsan Iqbal said that projects under China Pakistan Economic Corridor (CPEC) were moving forward swiftly and first batch including energy and infrastructure projects would be completed by fiscal year 2017 18. 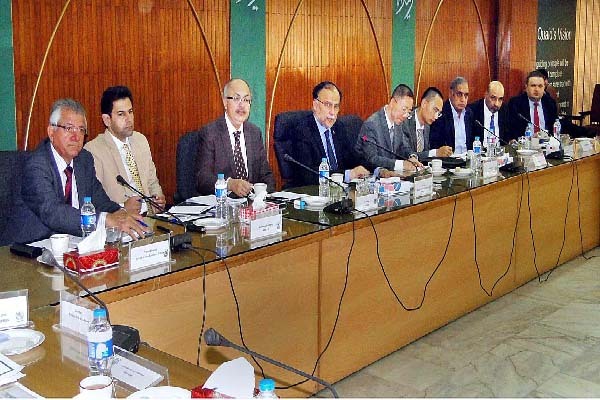 Work on Western Route is progressing satisfactorily, the minister said while chairing a high level meeting to review progress on CPEC projects and preparation of the upcoming CPEC Summit and Expo to be held on 29th August 2016. The minister directed National Highway Authority (NHA) authorities to hire local engineers on Western Route as it would provide employment opportunities to Pakistani engineers and boost up economic activity. The meeting was informed that Gwadar Airport and Eastbay Expressway in Gwadar are in advanced stages of approval by Chinese side and will hit ground breaking within a couple of months. Minister directed to fast track work on technical and vocational training institutes of Gwadar and make them operational as early as possible . He said CPEC was the top priority of the government and Economic Corridor’s early harvest projects would be completed at a rapid pace. While reviewing the energy projects in CPEC, Ahsan Iqbal said that speedy work on these projects is necessary to tackle the energy crisis and power needs of industrial zones in future under CPEC. He said that with the completion of the early harvest energy projects, 10,000 MW would be added in national grid by 2018. Ahsan Iqbal also underlined the need to use CPEC projects for making country a manufacturing economy rather a trading one for sustained economic growth. ‘The China Pakistan Economic Corridor (CPEC is fate changer for 3 billion people across the region and politics on this national project will be injustice with the people of Pakistan,” minister said. CPEC projects which he said will equally benefit the most backward areas of Pakistan. It will not only connect 200 million of Pakistan rather it would open several avenues of cooperation for the people, communities and states across the region. He further added that no one will be allowed to sabotage this project of national importance. The meeting also reviewed the preparations of CPEC Summit and Expo which will be held on 29 August 2016 at Pakistan China Friendship Center Islamabad. It is being hosted by Ministry of Planning, Development and Reform to mark the signing of $ 46 billion CPEC programme. The Summit aims to enhance awareness about CPEC initiative, its scope, time frame and investments. Federal Minister Ahsan Iqbal directed relevant ministries and stall holders to showcase their achievements at the upcoming CPEC Expo and leave no stone unturned to make it successful. He said that CPEC Summit and Expo will provide a platform for exchanging ideas and open new avenues for increasing business. This will help strengthen business to business relationships, he said adding the summit would enable provinces to explore opportunities to promote inclusive development and create strong links between academia and industry for collaborative. Minister said that the CPEC Summit would bring opportunities for Pakistani Investors and will enable them to develop collaboration with Chinese enterprises. It would also create awareness about CPEC among private sector of Pakistan and about developing business opportunities .